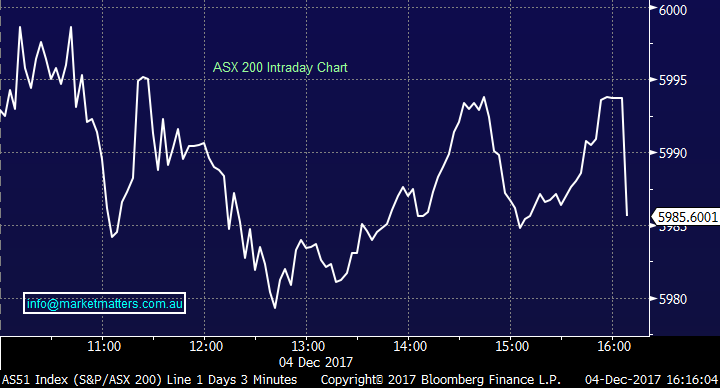 Despite S&P Futures in the US trading up +16pts (+0.65%) the Aussie market struggled to hold above water today with the banks providing most drag – the big 4 detracting around 10.5 index points from the ASX 200. 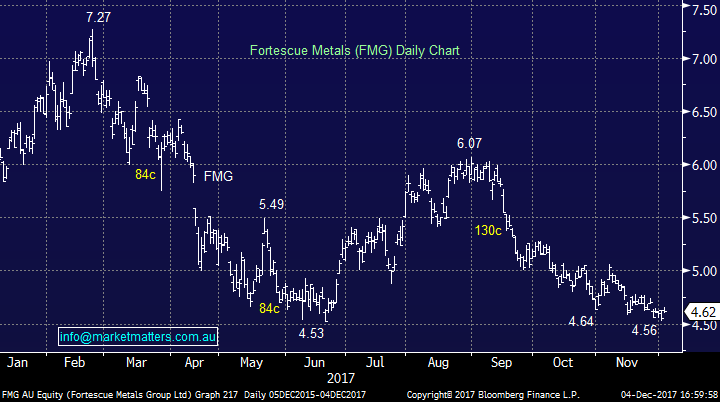 The miners did OK on the back of decent buying in the commodity complex on Friday + we saw Iron Ore FUTURES trade up +4.4% in Asia today and clearly the recent flow of better manufacturing data globally (US ISM out Friday) is creating some buying within the sector. 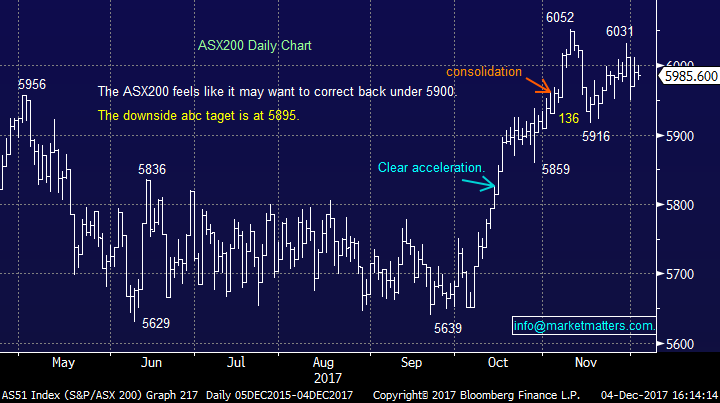 Metcash, the ugly duckling of the Australian Supermarkets sector has been anything but this year, and reported another set of decent numbers today – with the stock up +9.09% as a result. 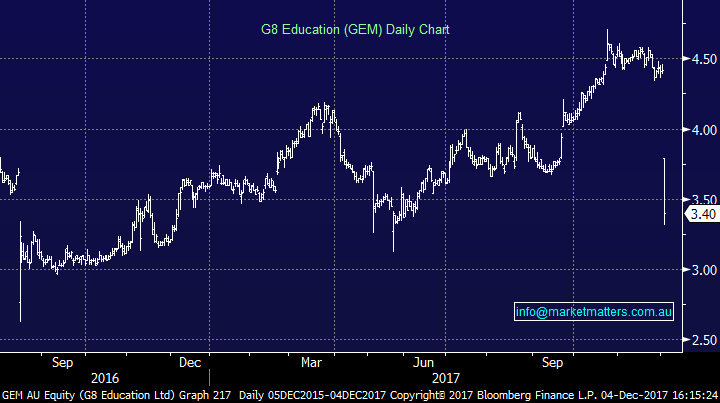 On the flipside, G8 Education (GEM) was sold, and sold hard after downgrading guidance with the stock having its worst day in 8 years falling by 23.08%. We looked at this today as a potential BUY in the income portfolio into the prevailing weakness, however it’s still hard to get excited on current multiples and tough 2018 ahead. More on this below. On the mkt today, the early buying was soon offset by selling in the banks, and therefore the index struggled. The Materials did well, but not well enough - a reasonably tight range today of +/- 21 points, a high of 6000, a low of 5979 and a close of 5985, off -4pts or -0.07%. 1. 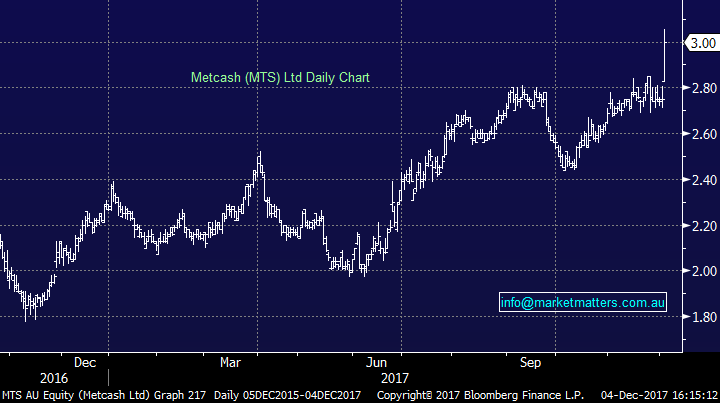 Metcash (MTS) - rallied 9.09% higher to $.3.01 after reporting its 1H17 numbers with a $92.9m net income (up 24%) slightly above most analyst’s expectation and an interim dividend of $0.06/a share. Clearly, the uptick in sales was driven in part by the Market Matters Christmas Party on Saturday night, with supplies being purchased from the IGA bottle shop in Balgowlah Heights for the annual end of year festivities at my place! 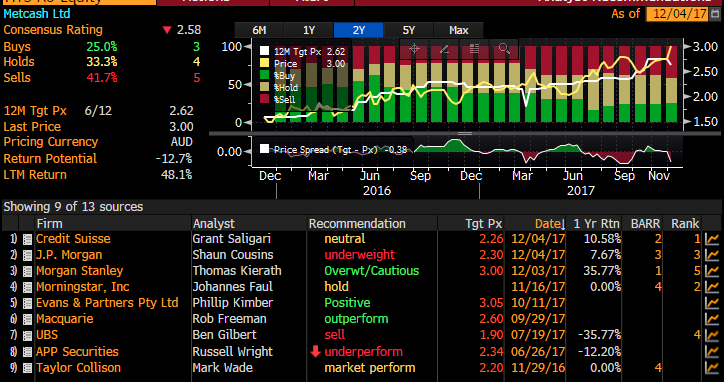 Expect upgrades on their expected full year result to flow through overnight despite the BIG run up in price experienced over the past 12 months – versus the more fancied WOW & Coles. MTS have beavered away in the background fixing up their business, deleveraging their balance sheet, and bedding down their hardware operation which is doing better than the market was positioned for. Food still difficult however liquor sales were good. I’ve often thought / rated MTS strategy of differentiation, targeting convenience over price – obviously price matters and they need to be in the ballpark , but it’s not as crucial as it is with the big guys that are traditionally in shopping centres (versus IGA that is typically not). The last 12 months have been stellar for MTS, while WOW has also outperformed the broader mkt. WES has underperformed by around 3%. 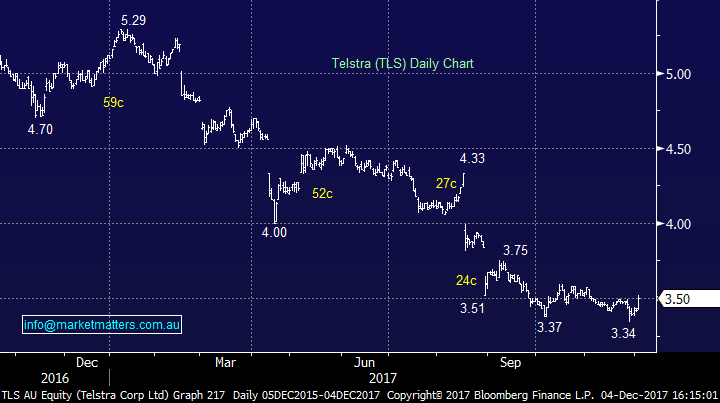 Brokers are still negative MTS, and upgrades now will be very begrudging…consensus price target @ $2.62 before today’s result. …and MTS remains in the top 10 shorts. 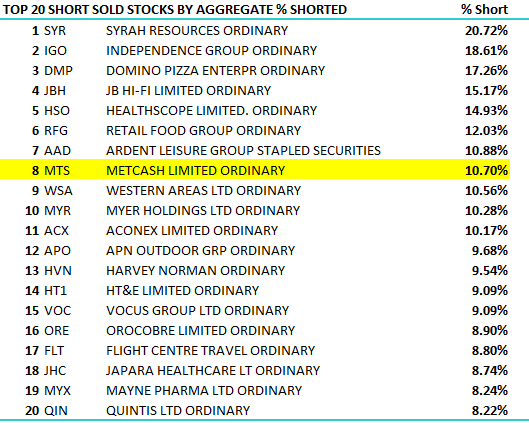 It used to be higher so shorts have been capitulating to some degree but still 10% of the float short sold, or about 100m shares. We’ve spoken recently about shorts being covered into Christmas, we’ve seen this play out in a few stocks of late, and MTS could certainly be another that sees sustained buying – its trading on 14.22x forward versus WES / 17.41x & WOW / 21.16x. 2. 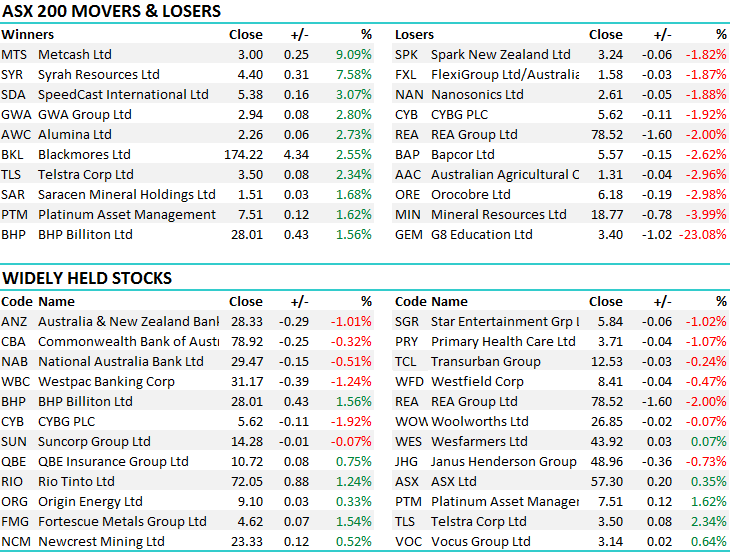 G8 Education (GEM) – Stock whacked today 23% to close at $3.40 on a material downgrade and very weak commentary. The initial weakness was sharp, then some bargain hunting came in but that didn’t last and the stock closed near enough to the lows. The main issue here is around occupancy at a time when regulatory costs are rising therefore earnings under pressure, and that should continue into next year. Average like-for-like occupancy for FY2017 forecast to be circa 77%, compared to 79.7% for FY2016. We don’t expect an improvement in FY18 and that’s the issue, although on 13x forward, it’s starting to get cheap. That said, the thematic of rising regulation, the need to pay more for acquisitions of scale (given GEMS size) and deteriorating occupancy and it’s hard to see GEM’s share price to bounce back strongly. Could MTS (or parts thereof) become a target for Amazon like WholeFoods was in the US ?